Place bread cubes in a single layer in a casserole dish. Set aside. In a large bowl, beat eggs with rum. Stir in milk and brown sugar, mixing well. Add cinnamon and nutmeg, stirring until spices are thoroughly mixed into liquid. Pour mixture over prepared bread cubes. Cover with plastic wrap, and refrigerate for one hour. Generously butter a 9x5x3-inch loaf pan. Set aside. Heat oven to 350 F. Remove bread/egg mixture from refrigerator. In a medium bowl, mash two very ripe bananas. Stir into bread mixture. Spoon mixture into prepared loaf pan. Bake for 45 minutes or until done. Let cool 15 minutes. Invert onto serving platter. Melt butter with rum in a medium saucepan over medium heat. Stir in sugar. Increase heat to medium high and bring to a boil. Boil, stirring constantly with a wooden spoon, for five minutes. Remove from heat and let cool for five minutes. Stir in heavy cream. If mixture thickens before using, heat at medium setting in microwave. Diagonally cut firm banana into 13 pieces. Spoon rum caramel sauce over bread pudding, allowing the sauce to drip down sides. Place 5 slices of banana in a zig-zag pattern down center of bread pudding. 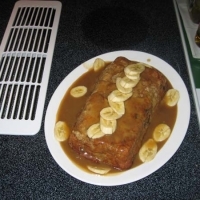 Place two banana pieces on plate in each corner of the bread pudding. Fantastic! I love this with the caramel. Like gardener's recipes? Never miss an upload!